A few months ago I reviewed a program All About Spelling by Marie Rippel. One that I will be using for years to come with our kiddos. I am that much in love with the program. 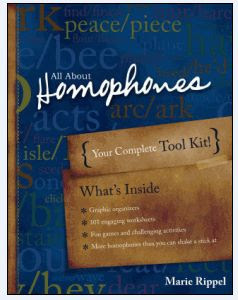 Needless to say, I was thrilled beyond measure when they sent me a second product of theirs to review called All About Homophones: Your Complete Tool Kit. This is an amazing resource to help teach your children homophones quickly and easily (homophones are words that sound the same but are spelled differently...be/bee, sea/see, etc...). All About Homophones comes with homophone worksheets, games and activities, and includes over 200 pages of teaching tools and resources for you to help teach your child about homophones. The graphics alone in the book are wonderful and the curriculum itself is even better! My girls have loved playing card games such as Go Fish!, Pig, Old Maid and more to help in learning the different words and their meanings. The information is presented in such a fun and interactive way that the girls forgot we were doing school - and to me, that's what learning is really all about! Everything that you need for All About Homophones is included in the book you receive: reproducible pages for the card games, worksheets, graphic organizers, crossword puzzles, student record sheets, grade-level lists, teaching plans, and more! You can purchase a softcover printed copy ($19.95) or an ebook version ($17.95). two ewes inn you're school thyme." See? Even I am having too much fun with it! oooh i like this one too. Gotta make a decision quickly, that's a good coupon!! !